Show #25 gets back to the speculative fiction with some thoughts on losing — and finding — my interest in scifi, reviews of the Does My Geek, Roll 2d6 and BrickNebula podcasts, and a review of John Scalzi’s military SF novel, Old Man’s War. There’s also news of the Nuketown beta and a possible theme song. Show revisions: Trying to put a little more polish on the show, making it sound a bit more professional. Not trying to make it hyper-refined, but do want to standardize somethings. Let me know what you think. Although grew up a scifi geek, I’ve spent much of the last few years ready almost exclusively fantasy titles, namely Robert Jordan and George R.R. Martin. Partly because most of Audible’s SF/Fantasy selections fall heavily on the fantasy side. Partly because I needed to expand my fantasy education. And partly because transhuman technobabble just wasn’t doing it for me. Which is why my copy of “The Hard SF Revolution” went mostly unread for so many months — the first few stories were all about that transhuman/posthuman infopolypse. I’ve been itching to get back into SF though, and now — after devouring John Scalzi’s Old Man’s War — I’m back. It’s a fun book — full review later in the podcast — and its got me hungering for more SF. So I’ve done some subscription shuffling, ditching Electronic Gamer Monthly for Analog (which I’ve read on and off for the last few years … mostly off). Dusted off the Hard SF anthology, and now that I’m past the stories about computerized humans and galactic minds, I’m finding it a pleasant read. One I’m even looking forward to each night. And I’m looking for more. I’ve still got Neil Stephenson’s Quicksilver to finish (not SF, but in that vein). And I need some recommendations. Got any? I’m looking for modern SF with a hard sf approuch — think early Heinlein, Clarke, Asimov, Bova and Brin. 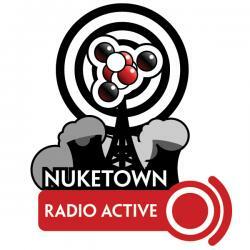 Send suggestions to nuketown@gmail.com. Roll 2d6 [Web Archive]: Great podcast focusing on all manner of table-top gaming, usually board, war or card games, but occasionally venturing into RPGs. Shows have included “Top Seven Most Influential Games”, “How to Explain Gaming to Non-Gamers”, “Starship Battles” and “Gaming Advocacy”. Shows average about an hour. Does My Geek… [Web Archive]: General interest geek cast discussing gaming, movies, books and beer. BrickNebula [Web Archive]: A podcast that mixes LEGOS with science fiction. Yog-Sogoth Radio: Episode #7 is online and features an interview with Sandy Petersen, author of Call of Cthulhu. Flock [Web Archive]: A social browser with built in hooks to a number of blogging platforms, del.icio.us and Flickr. Enjoying it, but it’s very beta. In the future, humanity is at war. It’s colonies are constantly under assault by a hordes of different alien races. All that stands between Earth and destruction is the Colonial Defense Force, which staffs its interstellar army using 75-year-olds. John Perry is one of these recruits — he joins up with a bunch of other geriatrics, and is pleasantly surprised when his old body isn’t upgraded — it’s completely ditched in favor of a new fast-grown clone enhanced with all manner of terrestrial and alien biotechs. A fast and fun hard sf reads like Starship Troopers without the philosophizing. Also reminiscent of Joe Hadleman’s Forever War (again, without the heavy social aspects). Some very cool technologies in here — I loved the skip drive (which doesn’t so much move you in space as it does flick you to another universe) but he does occasionally suffer from the old scifi trap of explaining something in one chapter, only to have that very element coincidentally used in the next). Clones were cool, as was the exploration of the eldsters in their new bodies. Solid, fun read, the sort of thing that’s great for recharging your scifi batteries. And mine were certainly in desperate need of that.